Key Message: The aetiology, predisposing factors, diagnostic approaches, and management strategies to reduce the incidence of iatrogenic peripheral nerve injuries are discussed in this article. Iatrogenic peripheral nerve injuries are largely avoidable. They are a potential source of major disability for the patient, and represent potentially catastrophic complications, which can affect patients in any surgical specialty. In addition, they are associated with substantial distress to the medical team, protracted litigation and impose a huge financial burden on healthcare systems. The incidence of peripheral nerve injury remains uncertain and can range from 0.03% to 0.11%., These types of injuries are rarely reported, and hence there is sparse literature regarding the factors determining the outcome. Peripheral nerve injuries are commonly attributed to improper patient positioning and lengthy surgeries. Predisposing factors such as diabetes mellitus, smoking, and a high body mass index contribute to the risk of a PNI. Peripheral nerve damage can occur at any time perioperatively and is thought to arise from a continuous stretch and/or compression of the vulnerable peripheral nerves in forced positions. The mechanisms that cause the injury are sometimes difficult to identify but all are generally preventable and can be direct, due to elongation, ischaemia and/or prolonged compression. Ischaemia secondary to tissue compression can be the result of poor perfusion due to arterial occlusion and interruption of the blood supply of the nerve. We will address the aetiology, predisposing factors, diagnostic approaches, and management strategies to reduce the incidence of iatrogenic peripheral nerve injuries. Our aim is to raise awareness among health practitioners of the risks of iatrogenic nerve injury, with the hope of helping to reduce the incidence of these injuries, and also facilitating their management in a more timely manner than is usually the case today. (i) Direct nerve injury; (ii) mechanical factors, such as compression, or retractor induced stretch; (iii) ischaemia; (iv) toxicity of injected solutions; (v) double crush syndrome; or, (vi) a combination of the above factors. Nerves may be unduly vulnerable to trauma as a result of pre-existing predisposing factors. Welch et al., suggested that reduced blood flow in hypertensive patients may cause nerves to become more susceptible to injury. The patient related factors, such as hypertension, diabetes mellitus, and smoking, cause microvascular changes and may render these patients more susceptible to PNI.,, In a series, Menezes et al., found that a body mass index greater than 30 is significantly associated with peripheral nerve injury. Pre-existing peripheral neuropathies may predispose to PNI and the 'double crush' syndrome, through alteration in neuronal homeostasis, may also play a role in these patients. Anatomical abnormalities especially in the thoracic outlet and at the elbow may also predispose patients to PNI. The brachial plexus injury secondary to traction as an indirect consequence of the use of physical restraints has been reported. Perioperative factors such as hypovolaemia, dehydration, hypotension, hypoxia, electrolyte disturbances, and hypothermia have been implicated in the development of PNI. The management of iatrogenic nerve injury has four aims: first, to identify the level and type of the lesion; second, to correct the underlying pathology; third, to alleviate symptoms; and fourth, to support, reassure and inform the patient. If a previously asymptomatic patient develops a neurological deficit in an entire nerve or part of it, following an intervention (often a surgical procedure performed on the patient), then one must presume that the intervention had caused the problem. A thorough history coupled with an immediate detailed neurological examination is the most crucial step in obtaining an accurate diagnosis and then in formulating a strategy for further management. The neurological examination serves to recognize the type of injury, the site of the lesion and the severity of the motor, sensory or both motor-sensory impairment, which is of prognostic value. If a deficit is found, electrophysiological tests are performed to precisely identify the level of the lesion and to assess the potential for regeneration. In this regard, an early consultation with a neurologist is advisable. In general, neurapraxia carries a good prognosis, but if the diagnosis is in doubt, a delay may cause continuing ischemia or compression, which may result in a worsening of the nerve lesion to axonotmesis or even neurotmesis. The decision regarding surgical or conservative treatment is usually achieved with the aid of clinical examination and electrodiagnostic tests. Often a trial of conservative treatment is instituted. If the nerve does not show recovery on follow-up examinations, surgery is performed. The most important prognostic factor is the timing of the corrective operation. When the mechanism responsible for the damage is unknown, it is preferable to wait for 3 months with monthly neurological examinations. If it is noted during an operation that a nerve has been severed, it should be repaired primarily immediately during the same operation. Kretschmer et al., reported that the mean time between sustenance of an iatrogenic injury and referral for nerve repair was 21 months (the duration ranged from 2 weeks to 27 years) and pointed out that two-thirds of the patients were referred at a time that was less than optimal for exploration and repair. Furthermore, adequate pain management is very important and has a positive influence in the prognosis of these patients, both in terms of improving their quality of life and functional recovery. The role of aggressive physiotherapy in facilitating rehabilitation and functional restoration cannot be overemphasized and is a key factor in improving the prognosis, until nerve regeneration has occurred. Positioning patients on the operating table is a foremost challenge to surgeons and anaesthetists in their every day practice and requires an awareness of the potential dangers of the various surgical positions utilised. Each position has its specific risks and should be evaluated against the benefits. In positions in which pressure or strain on the neurovascular structures is possible, careful attention to body alignment is necessary. Appropriate padding of bony prominences when positioning the patients for surgery is indispensable in preventing iatrogenic peripheral nerve injuries. The body and limbs are often required to adopt a strained posture to facilitate an optimal exposure of the surgical site, to preserving the surrounding structures around the area of focus during surgery, and to maintain the patient's airway and other vital functions. The impact that positioning can have on each patient is vital and a detailed knowledge of anatomy, physiology, and body dynamics are crucial to help in ensuring a safe positioning. Cautious positioning of every patient on the operating table will reduce, but not eliminate, injuries to the peripheral nerves. Injuries can be easily avoided with knowledge of safe limb positions, familiarity with the anatomy of the region and understanding the common sites of injury. Positioning for surgery is the joint responsibility of the surgeon and anaesthesiologist and requires careful planning, and communication between the surgical and anaesthetic teams. The anaesthetist should be aware of the potential for nerve injury, and interventions which can minimise the risk should be initiated. Hypotension should be avoided and haemodynamic stability should be maintained. Pre-existing coagulopathy should be identified and treated. Patients with pre-existing neuropathy should be cautiously evaluated and the findings should be documented. The tourniquet pressure and the duration of application must be minimised. Psychiatric patients, and irritable head-injured patients are often kept immobilized during their hospitalization period to avoid self-inflicted injuries. Their inadequate positioning can lead to PNI. The use of restraints in medical practice is seen as a necessary evil and alternative methods like chemical restraints and the usage of behavioural therapy should be encouraged. Brachial plexus injuries have been seen following surgery in the supine, lateral decubitus, prone and Trendelenburg positions [Table 2] and have an overall incidence of approximately one in 2000. The brachial plexus is particularly susceptible to injury due to certain factors such as its relatively long course in the neck and axilla, passing through a confined space between the clavicle and the first rib; its tethering between two fixed points (proximally by the nerve roots and distally by the axillary sheath); and, its close proximity to bony structures against which it may be compressed. Anatomical variation of the thoracic outlet, such as the presence of an extra rib on the seventh cervical vertebra, may be a predisposing factor and can also be implicated in brachial plexus injury. In order to prevent brachial plexus lesions, abduction of the arm should preferably be limited to 90 degree or less. Prospective studies of peri-operative ulnar nerve injury found an incidence of 1:215 to 1:385., This injury usually occurs at the superficial condylar groove of the elbow. The superficial nature of the ulnar nerve and its close proximity to the medial condyle make this the most common perioperative nerve injury. Men have a greater propensity to develop ulnar nerve injury which has been attributed to less adipose tissue around the cubital tunnel and their having a larger coronoid tubercle compared with women. The most common cited causes of ulnar nerve injury are direct pressure on the ulnar groove at the elbow and prolonged forearm flexion. The direct nerve damage from regional anaesthetic techniques during the conduction of invasive procedures around the elbow, and compression of the nerve in the carpal tunnel, are usually implicated in causing injury to this nerve. To protect the median nerve, padding of the arm should be mandatory, the forearm should be kept in the supine position or in the neutral position, and the flexion/extension movements of the elbow should be of <90 degree. This nerve injury generally occurs as a result of compression of the nerve between the edge of the operating table and the humerus. It may occur when the patient is in the lateral position and the uppermost part of the arm is abducted beyond 90 degrees and is suspended from a vertical screen support. The lithotomy and sitting positions have been implicated in perioperative injury to this nerve due to hyperflexion of the hip, as well as abduction and extension of the leg causing nerve stretching. Regional anaesthetic techniques and hip arthroplasty may also cause injury to this nerve. Sciatic nerve injury has been reported following the institution of a coronary artery bypass graft, probably as a result of prolonged nerve pressure compounded by the lowered arterial perfusion pressure provided by the cardiopulmonary bypass. This is the most frequently damaged nerve in the lower limb and its injury is most likely to occur as a consequence of the lithotomy positioning, where it might be compressed against the head of the fibula., This nerve injury also has been described in the lateral position where the nerve may be compressed between the fibula and the operating table; and, in the sitting position due to the nerve stretch and pressure., The most vulnerable site of this nerve injury is around the head of the fibula, which should be free from external pressure to protect against nerve injury. Intraoperative monitoring, especially the somatosensory evoked potential (SSEP) monitoring, has been shown to be useful for the early detection of peripheral nerve injury. The monitoring enables the detection of waveform changes signifying an early nerve injury, although the sensitivity of monitoring is low. The use of SSEP may decrease the medical costs for patients identified as being at high risk for developing PNI. Ying et al., in their retrospective series of 485 patients who had undergone microvascular decompression (for hemifacial spasm and trigeminal neuralgia) in the park-bench position, bilaterally monitored the ulnar and median nerves of these patients routinely utilizing SSEP. 14 (2.9%) patients had intraoperative changes with a reduction in amplitude of 50%. In these cases, when the position of the patient was checked, it was found that excessive traction of the shoulder, hyperextension of the neck, and compression of the elbow were the probable causes of this reduction in SSEP waveforms. The use of intramuscular injections has increased significantly in the developing world and at least 50% of injections administered annually in developing countries may be considered unsafe and leave patients vulnerable to serious health risks., Administration of an intramuscular injection is the commonest cause of iatrogenic nerve injuries and an often abused form of medical intervention in developing countries. The senior author of this article has reported that iatrogenic injection injuries are the most common (52.9%) forms of all nerve injuries in children and they are due to a faulty technique or the administration of the injection at an improper site. In a study, it was found that 11% of the patients with nerve injury were due to the administration of injections. The indiscriminate use of intramuscular injections should be discouraged and the choice of a proper site of injection should be stressed to the caregivers and doctors. The size of the injection needle should also be according to the age and built of children. It has been reported that the lesions induced by short bevelled needles are more severe, more frequent and take longer to heal than those induced by long bevelled needles.,, The ventrogluteal site is the preferred site for intramuscular injections in the gluteal region as it is more difficult to reach the sciatic nerve with a needle in this position than with the dorsogluteal approach. The anterolateral thigh in infants and the deltoid in older children should be used for intramuscular injections and the buttock is not recommended. The treatment options include an early neurolysis, a delayed exploration with neurolysis, or resection and anastomosis. Although iatrogenic peripheral nerve injuries account for a small proportion of medicolegal claims, they are difficult to defend, being essentially avoidable. Anaesthesia related nerve injury is the third-most common cause of anaesthesia-related litigation. The treating physician cannot influence the course of the neurological deficits occurring as a result of the injury, the involved nerve, the site and degree of damage, and other patient-specific factors, but he or she can make a correct diagnosis and insure that an appropriate therapy is initiated at the most favourable time. Just reassuring patients with iatrogenic nerve injuries or not even informing them about their nerve injury may lead to wastage of precious time, and the hope for neurological improvement may be reduced or even lost. This is not an acceptable and ethical medical practice. Iatrogenic nerve injuries can occur during many surgical procedures and prevention remains the mainstay of the management of such injuries. Patients with iatrogenic nerve injuries should be evaluated thoroughly as soon as possible by experts with experience in nerve injuries so that the correct diagnosis can be reached and the appropriate therapy planned. The timing of reconstructive surgery is crucial for functional recovery. Iatrogenic nerve injuries constitute an intricate, multifactorial problem, which cannot be resolved by surgery alone. Thus, the management should include prevention, an early diagnosis, an appropriate treatment with rehabilitation, psychological support and the control of pain. Apart from the clinical challenges, medicolegal issues may ensue, when nerve damage is caused by medical intervention. The significance of preoperative counselling regarding the potential likelihood of injury and the accurate documentation of intraoperative and postoperative findings cannot be overemphasized. Welch MB, Brummett CM, Welch TD, Tremper KK, Shanks AM, Guglani P, et al. Perioperative peripheral nerve injuries: A retrospective study of 380,680 cases during a 10-year period at a single institution. Anesthesiology 2009;111:490-7. Esquivel-Enriquez P, Perez-Neri I, Manrique-Carmona L. Neurosurgical position causes peripheral nerve injuries?. Cirugia y cirujanos 2017;85:493-8. Devi BI, Konar SK, Bhat DI, Shukla DP, Bharath R, Gopalakrishnan MS. Predictors of surgical outcomes of traumatic peripheral nerve injuries in children: An institutional experience. Pediatr Neurosurg 2018;53:94-9. Winfree CJ, Kline DG. Intraoperative positioning nerve injuries. Surg Neurol 2005;63:5-18. Vander Salm TJ, Cereda JM, Cutler BS. Brachial plexus injury following median sternotomy. J Thorac Cardiovasc Surg 1980;80:447-52. Casscells CD, Lindsey RW, Ebersole J, Li B. Ulnar neuropathy after median sternotomy. Cin Orthop Relat Res 1993; 291:259-65. Vinik AI, Mehrabyan A. Diabetic neuropathies. Med Clin North Am 2004;88:947-99, xi. Richardson JK, Jamieson SC. Cigarette smoking and ulnar mononeuropathy at the elbow. Am J Phys Med Rehab 2004;83:730-4. Menezes S, Rodrigues R, Tranquada R, Muller S, Gama K, Manso T. Injuries resulting from positioning for surgery: Incidence and risk factors. Acta Med Port 2013;26:12-6. Guedes-Correa JF, Pereira M, Torrao-Junior FJL, Martins JV, Barbosa DAN. A Neglected cause of iatrogenic brachial plexus injuries in psychiatric patients. Neurosurgery 2018;82:307-11. Sawyer RJ, Richmond MN, Hickey JD, Jarrratt JA. 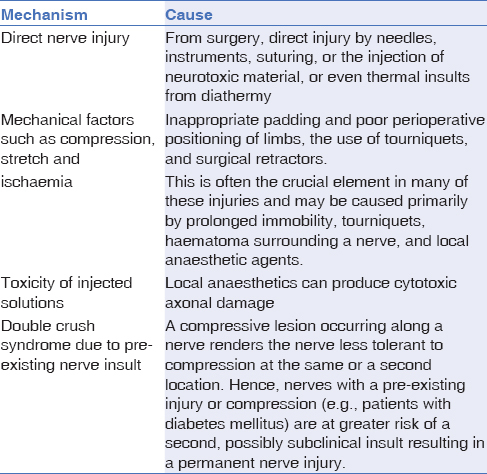 Peripheral nerve injuries associated with anaesthesia. Anaesthesia 2000;55:980-91. Kretschmer T, Antoniadis G, Braun V, Rath SA, Richter HP. Evaluation of iatrogenic lesions in 722 surgically treated cases of peripheral nerve trauma. J Neurosurg 2001;94:905-12. Devi Indira B, Garg N, Shukla D. Positionong in Neurosurgery. Tandon PN, Ramamurthu R. Ramamurthi And Tandon's Textbook of Neurosurgery (2 Volumes): New Delhi Jaypee Brothers Pvt Ltd; 2012.pp 2299-304. Rozet I, Vavilala MS. Risks and benefits of patient positioning during neurosurgical care. Anesthesiol Clin 2007;25:631-53, x.
DePasse JM, Palumbo MA, Haque M, Eberson CP, Daniels AH. Complications associated with prone positioning in elective spinal surgery. World J Orthop 2015;6:351-9. Hewson DW, Bedforth NM, Hardman JG. Peripheral nerve injury arising in anaesthesia practice. Anaesthesia 2018;73 Suppl 1:51-60. Warner MA, Warner DO, Matsumoto JY, Harper CM, Schroeder DR, Maxson PM. Ulnar neuropathy in surgical patients. Anesthesiology 1999;90:54-9. Alvine FG, Schurrer ME. Postoperative ulnar-nerve palsy. Are there predisposing factors? J Bone Joint Surg (Am) 1987;69:255-9. Prielipp RC, Morell RC, Butterworth J. Ulnar nerve injury and perioperative arm positioning. Anesthesiol Clin North Am 2002;20:589-603. Wadsworth TG, Williams JR. Cubital tunnel external compression syndrome. Br Med J 1973;1(5854):662-6. Nicholson MJ, Eversole UH. Nerve injuries incident to anesthesia and operation. Anesth Analg 1957;36:19-32. Cameron MG, Stewart OJ. Ulnar nerve injury associated with anaesthesia. Can Anaesth Soc J 1975;22:253-64. Garland H, Moorhouse D. Compressive lesions of the external popliteal (common peroneal) nerve. Br Med J 1952;2(4799):1373-8. Keykhah MM, Rosenberg H. Bilateral footdrop after craniotomy in the sitting position. Anesthesiology 1979;51:163-4. Baumann SB, Welch WC, Bloom MJ. Intraoperative SSEP detection of ulnar nerve compression or ischemia in an obese patient: A unique complication associated with a specialized spinal retraction system. Arch Phys Med Rehabil 2000;81:130-2. Jones SC, Fernau R, Woeltjen BL. Use of somatosensory evoked potentials to detect peripheral ischemia and potential injury resulting from positioning of the surgical patient: Case reports and discussion. Spine J 2004;4:360-2. Ying T, Wang X, Sun H, Tang Y, Yuan Y, Li S. Clinical usefulness of somatosensory evoked potentials for detection of peripheral nerve and brachial plexus injury secondary to malpositioning in microvascular decompression. J Clin Neurophysiol 2015;32:512-5. Reeler AV. Injections: A fatal attraction? Soc Sci Med 1990;31:1119-25. Kotwal A, Priya R, Thakur R, Gupta V, Kotwal J, Seth T. Injection practices in a metropolis of North India: Perceptions, determinants and issues of safety. Indian J Med Sci 2004;58:334-44. Kakati A, Bhat D, Devi BI, Shukla D. Injection nerve palsy. J Neurosci Rural Prac 2013;4:13-8. Diggle L, Deeks J. The position statement on injection technique. Archives of Disease in Childhood 2002;87:452-3. Warade AC, Jha AK, Pattankar S, Desai K. Injection-related iatrogenic peripheral nerves injuries-Surgical experience of 354 operated cases. Neurol India 2019;67:S47-52. Rice AS, McMahon SB. Peripheral nerve injury caused by injection needles used in regional anaesthesia: Influence of bevel configuration, studied in a rat model. Br J Anesth 1992;69:433-8. Cheney FW, Domino KB, Caplan RA, Posner KL. Nerve injury associated with anesthesia: A closed claims analysis. Anesthesiology 1999;90:1062-9.